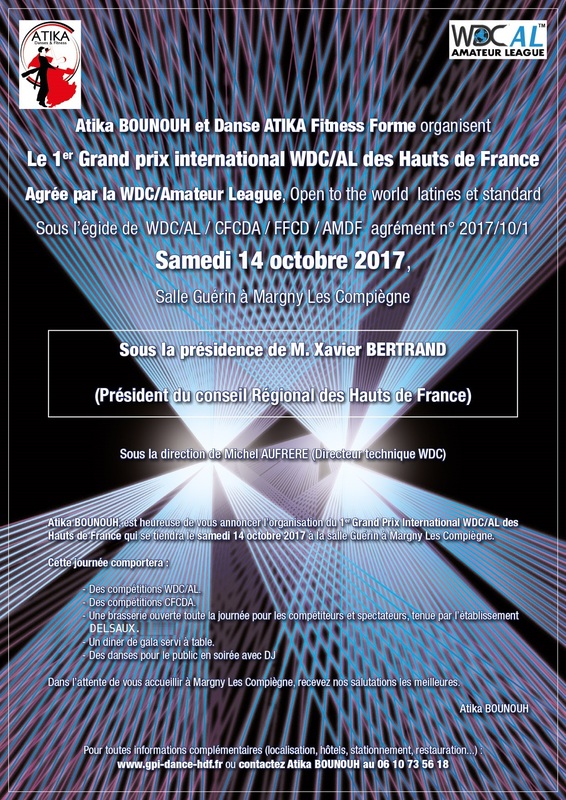 Following the success at the 1st International Grand Prix of Dance, we decided to organize a 2nd Grand Prix International Dance WDC / AL Hauts de France. We strive at every event to do our best in order to offer you a quality show and an unforgettable experience. For this reason, on the 13th October 2018, we made an appointment with the world’s top competitors who will make you dream with their dynamism, sensuality, elegance, flair and performance. Organize a competition that is both rigorous and convivial for dancers from around the world. Offer a lively, vibrant and intense show to the entire audience throughout the day, with demonstrations of local dancers and dance groups in the twinned towns of Compiègne and Lower Autumn. To allow all, competitors and public, to share our passion for dance on the track at the closing ball. The Hauts de France International Dance Grand Prix would not exist without the support of the public actors, the private partners and the volunteers. We would like to thank the Council of the Hauts de France region, the Council of the Oise department, the urban agglomeration of the Compiègne and Basse automne region and the town hall of Margny-Lès Compiègne for their support. We thank all the partners for their help, their involvement and their creativity. And we would like to thank all the volunteers.